I love the Super Bowl. I mean I love Super Bowl food. For the Super Bowl party we went to, I made deviled eggs. Just to take it up a notch, I added bacon and chives. And sprinkled them with smoked paprika. There was a also a contest for the best Super Bowl sundae topping. We made ittle bitty chocolate chip cookies. 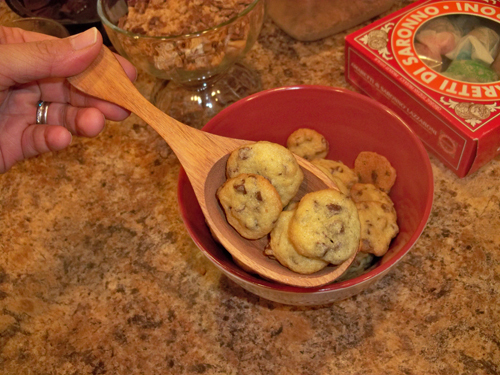 Do you know how long it takes to scoop out teeny weeny cookie? For-evah! 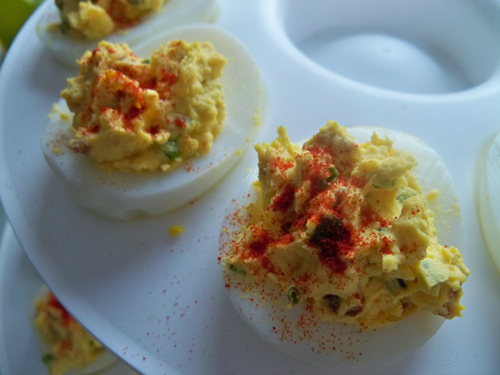 The deviled eggs looks delicious! 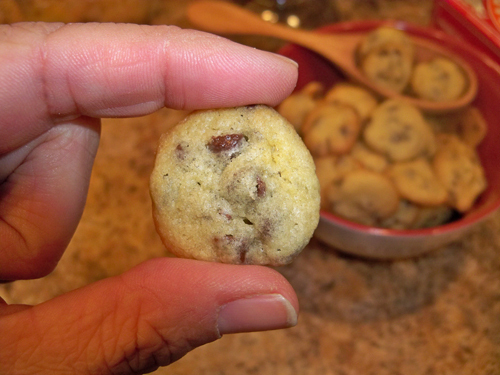 Love the mini cookies too -- except it's too easy to pop them in and forget how many I ate. I looooove deviled eggs. Good idea to add the bacon and chives. Sometimes I sprinkle dill on top, too. That's a neat deviled egg holder, BTW. And my grandparents used to have those salt and pepper shakers! Love them! 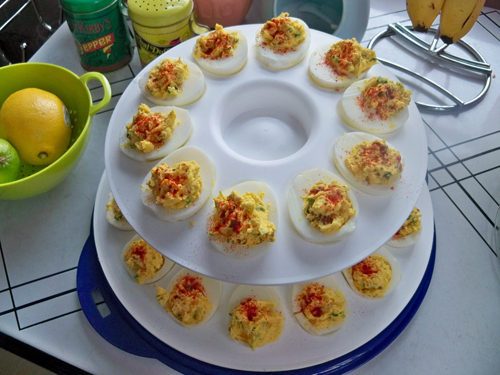 I'm often the designated deviled egg maker-bringer - who makes your deviled egg holder/display thingy? Is it rubbermaid or tupperware? Whatever it is, I need to get one! I'm tired of making pretty eggs only to have them slide all over in their container and get smeared on the sides! Looks tasty! I tried to explain to some Dutch colleagues that it isn't the Super Bowl game I miss, it's the party food. Maybe next year I'll host a party here, sans game, just for the food!